A physics lab deep below the Iron Range may have uncovered the first terrestrial evidence of dark matter. Scientists say dark matter probably makes up a lot of the weight in the universe, but its existence is still just a theory. Confirming that dark matter exists could provide an explanation why galaxies act the way they do - a physics mystery for decades. Scientists from The U.S. Department of Energy's Fermi Lab and Sanford University announced Thursday afternoon that they now have pretty good evidence that dark matter exists - and that the evidence was uncovered in the University of Minnesota's deep underground physics lab half a mile below the Iron Range town of Soudan. The experiment there is known as the Cryogenic Dark Matter Search, or CDMS II, managed by Fermi Lab since 2003. Eighteen institutions including the University of Minnesota participate in the experiment. A detector kept at almost absolute zero temperature waits for hits from what the scientists call WIMPS, short for weakly-interacting massive particles. 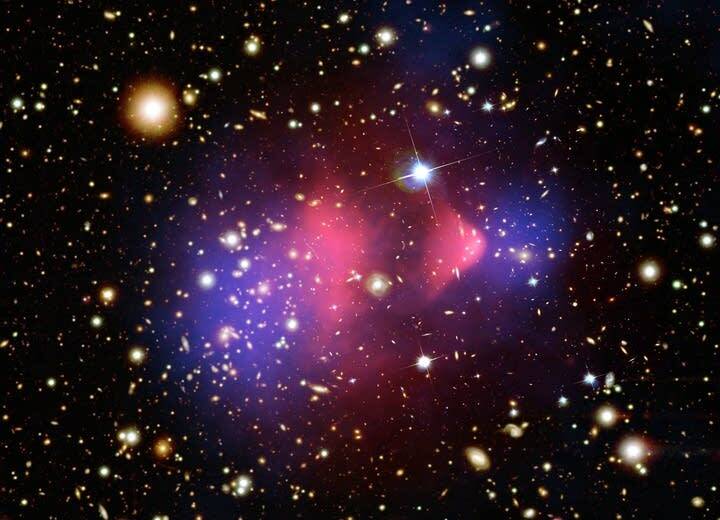 According to the theory, dark matter is made up of WIMPS. WIMPS may have formed in the big bang; the explosive event believed to have formed our universe. WIMPs are so tiny they can pass through the half-mile of rock above the Soudan Underground Mine lab, and once in a very rare while, they might hit something in the CDMS II detector, providing evidence they exist. And if they exist, dark matter exists. Or so the theory goes. The scientists have just analyzed data collected from 2007 and 2008, and they say they've spotted indications of two successful hits. They think they've caught a couple of WIMPS. Or, as Researcher Lauren Hsu explained to colleagues in a very technical presentation this afternoon, they can't say the two events are not WIMPS. "We cannot interpret these results as a statistically significant signal, but within the blind analysis we also cannot exclude either event as signals," Hsu said. Just two events still leaves a one in four chance the results are something else. Five WIMPS would provide more confidence. The scientists are carefully avoiding claiming success just yet. Keith Olive, a Distinguished McNight University Professor of Physics with the University of Minnesota, said dark matter, and the WIMPS it's made of are believed spread throughout the universe. "They're concentrated somewhat more in galaxies, and so they would be all around and just flying though the galaxy, and flying through us," Olive said. "They could pass through the earth with never interacting; just go right out the other end. But occasionally they will interact, and this experiment is designed to pick up those very rare interactions with these really pretty heavy particles." Dark matter would help explain one of the universe's enduring mysteries. Heavenly bodies act like they have more mass than anyone can identify. "In the '30s it was experiments looking at clusters of galaxies, and noticing that the motion of galaxies in these clusters was not right, in the sense that the galaxies were moving too fast, like there was more matter there, that they couldn't see," Olive said. "What that could be is the new particle," Olive said. So, now that they think they've confirmed dark matter, so what? Well, the potential discovery of these WIMPS is a very big thing for basic physics research, providing new understanding that eventually could lead to new technologies. If it is confirmed, he said, the particle could be reproduced and studied in a new Geneva, Switzerland accelerator, called the Large Hadron Collider. Olive said it's a big deal to the University of Minnesota, which has been involved in this and other high energy physics experiments for many years, in the Soudan Underground Laboratory. "So It's not just that it was discovered in the State of Minnesota, it's also people from the University of Minnesota being actively involved in this discovery," he said. Now, scientists want to expand the size of the Minnesota detector in hopes of getting the five total hits they say could confirm dark matter. They plan to increase the number of collectors on their detector three-fold by next summer. The University holds a special seminar to discuss the findings tomorrow. When: Friday, Dec. 18. 2:30 p.m.
Where University of Minnesota, Tate Physics Lab. 116 Church St SE, Minneapolis, Minn.